224 LPH, 1 GPM, 1/4” Inlet / Outlet, 50mm Diameter / 315mm Length . 448 LPH, 2 GPM, 1/2” Inlet / Outlet, 62.5mm Diameter / 370mm Length . .
Ultraviolet or UV water sterilizer are used in water purification and treatment to make water healthier and prolong the life of water that has been treated and processed. The word “sterile” is defined as being free from living germs or microorganisms. 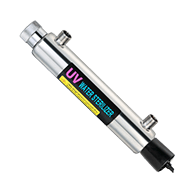 An Ultraviolet sterilizer extraordinarily cleans water and kills bacteria and microorganisms that can be able to infest water even after it has been treated. UV is a type of energy found in the electromagnetic spectrum, lying between x-rays and visible light. Although we cannot see Ultraviolet light or rays, we are exposed to them every time we step out into the sun. In fact, Ultraviolet light is responsible for causing sunburns. 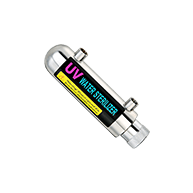 UV Water Purification systems use special lamps that emit UV light of a particular wavelength that have the ability, based on their length, to disrupt the DNA of micro-organisms. As water passes through a UV water treatment system, living organisms in water are exposed to UV light which attacks the genetic code of the microorganism and rearranges the DNA /RNA, eliminating the microorganism’s ability to function and reproduce. If a microorganism can no longer reproduce, it cannot replicate, therefore it cannot infect other organisms with which it has contact. This process of exposing water to Ultraviolet light is simple but effective, destroying 99.99‰ of harmful microorganisms without adding any chemicals to water. Many water purification systems take advantage of a UV water sterilizer even after processing their water. This is a well-known practice. Companies like Puritech highly recommend UV sterilizers as a post treatment when treating water. Throughout the years ultraviolet technology has become well established as a chosen method for effective and economical water disinfection. Ultraviolet water sterilization claims many advantages: All microorganisms are virtually susceptible to ultraviolet disinfection. For every penny of operating cost, hundreds of gallons of water are purified. NO additional chemicals are added and there’s no danger of overdosing. Once the water leaves the purifier, it is ready for use with no further contact time required. It has simple and easy to install and maintain. Compact units need a small space to operate and store. 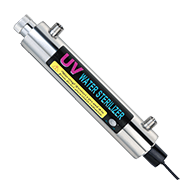 Ultraviolet water sterilizers deliver ongoing disinfection without special attention or measurement. There are no detections of chlorine taste or corrosion problems. 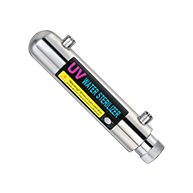 When you are in water bottling business, you will need to consider using a UV sterilizer to make sure that you kill all the bacteria that builds up in your storage tank. Every time you open your filling tap, the water goes through the uv system killing all micro organisms that can be harmful to your body. Who wants to cook with usafe water? We recommend that you add a uv sterilizer to your domestic system to ensure that the water is bacterial free and safe to consumer. It is also used in pond applications to control free-floating algae, control infections by stopping the spread of microorganisms from one fish/coral/invertebrate to another through the water. When operated correctly, free-floating microorganisms will be killed by the UV light. Note that the organisms must be in the water that flows to the UV sterilizer. The UV light has no residual effect and will not kill organisms attached to fish. 1.Ultraviolet Power Supply Unit – This is the main control of the Ultraviolet system. Some systems have a very simple controller, and others have a more complicated system that includes alarms, lamp change timers, trouble indicator lights, and more. Although Ultraviolet units vary in complexity and size, all controllers do basically the same thing of controlling the electrical output of the lamp and powers the UV-C light needed for water purification. 3.Ultraviolet System Housing – This part of the system contains the Ultraviolet sleeve and lamp, and also controls the flow of water through the system. 4.Outlet for treated (clean) water. 5.UV Bulb – The lamp of an UV system produces UV-C, which is Ultraviolet light considered to be germicidal. However, different lamps perform different functions, so they type of lamp used will be contingent on the application and disinfection requirements. 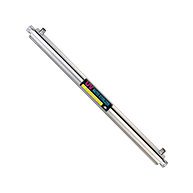 6.UV Quartz Sleeve – The quartz sleeve is made of quartz glass and is there to protect the UV lamp which is powered by electricity from the flow of water. The UV lamp transmits light through the tube into the water. It is important to clean the sleeve (generally when the lamp is changed) as minerals and contaminants in the water can cloud the glass tube. 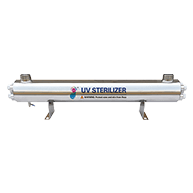 Have any problem with your UV Sterilizers?